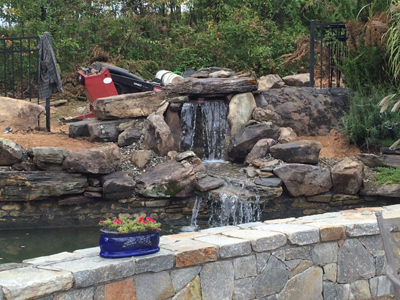 Pond and water feature repairs and renovations can range from filter replacement to completely rebuilding a stream or waterfall, and everything in between, and there are a variety of reasons you might need your pond or water feature repaired. You might just have outgrown your current water feature or want to add on it, or you might be having serious problems with it. Maybe you even purchased a house with a water feature and have no idea where to start. Poor water quality due to inadequate or improperly installed filtration are common reasons for pond repair, as are leaks in the water feature or the plumbing. These are also reasons why it’s important to choose a reputable contractor, such as a Certified Aquascape Contractor or Master Certified Aquascape Contractor to install your pond of water feature. However, if you have appropriate filtration and have still have algae problems you might want to take a few minutes and review our algae treatment page which offers a variety of solutions. However, it’s also important to remember that even a well-built pond can develop problems over time. 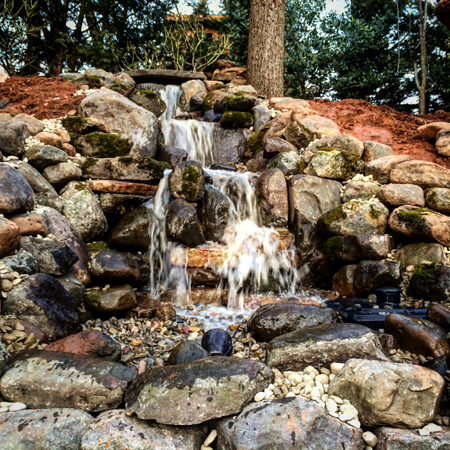 The most common issues result from movement or settling of the ground or rocks surrounding the water feature. As settling occurs it can cause low spots to form where the water can escape from the liner. Shifting rocks can also divert the water flow, causing it to splash off the rocks or even slowly seep out causing a more gradual leak. While some water loss is expected as a result of evaporation, a pond leak can cause your water levels to drop dramatically overnight and can be a severe problem. Living Artscapes, Inc. offers a variety of pond repair, pond rehab and pond renovations services. Ranging from pond leak repair to adding filtration to completely overhaulting or rebuilding your existing water feature and everything in between. Whatever your issue may be, we can repair the problem and allow you to start enjoying your water feature again. Contact us today so we can get started making your water gardening dreams come true!